When we bought our new house, I had no idea if they had any flower bulbs planted. When spring rolled around turns out not even a single daffodil or tulip came up. I had to wait until fall, but now it's time to plant bulbs. This year I'm concentrating on just daffodils. 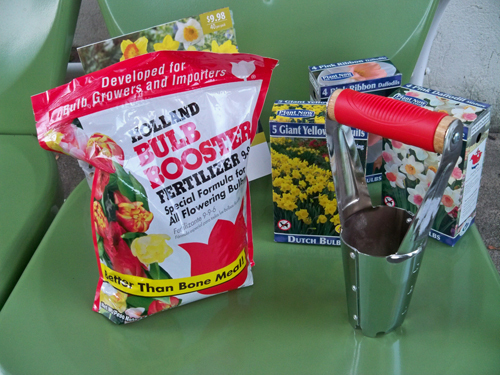 I always wanted to try one of these bulb planters so I got one along with some bulb fertilizer. It worked pretty well which was a good thing since we had about 50 bulbs to plant! At our local Home DEpot, they also have a bulb digger that you step/stand on to push it into the dirt -- that works well too :) Have fun with your flowers! 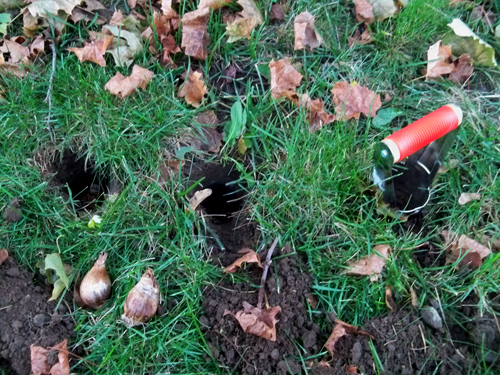 you can also dig a large hole about 6" deep with a shovel and put a lot of bulbs into the hole at once. You can make it any shape or curve it through your landscape. It's a good way to plant a lot of bulbs at one time instead of having to plant them individually. Hi Jenny, I don't usually comment but I think you'll like these domo cookies! BoxofBeans - those are hilarious! Thanks for the link!